WORCESTER – Take about 11 acres of land, buy much of the property, tear down decrepit buildings, give new construction a tax break and then resell available parcels to developers. That’s the recipe the city of Worcester followed with the South Worcester Industrial Park over close to two decades, a swath of land wedged between Canterbury Street and railroad tracks. The land was once home to metal and machine manufacturers, a foundry and an auto salvage business. Today, the park is home to a pie maker and a manufacturing equipment seller. Soon, a modern manufacturing building for small businesses or startups will rise on another parcel. All of the parcels bought and cleared by the city have been sold or have deals in place. It’s a project that has rejuvenated a previously underwhelming stretch of Worcester business land and tapped into a market brimming with demand for modern production, distribution and warehouse space. For Harry Kokkinis, president of Worcester-based Table Talk Pies, it was also the answer to a frustrating search for expansion space in the city that had long been home for the privately held producer of pies. 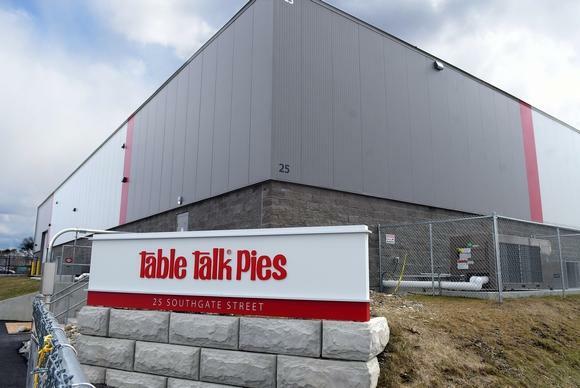 TableTalk now occupies a new building the size of a football field on Southgate Street, where it makes and distributes snack pies. “My mother was pretty happy when we found this,” Mr. Kokkinis said last week, as he walked through the 51,000-square-foot building while 4-inch cherry pies rolled out of an oversize oven. The South Worcester Industrial Park, sometimes abbreviated as SWIP, didn’t always look to be a success. The city acquired about 8 of the 11 acres, mostly after owners failed to pay taxes, according to Paul Morano Jr., assistant chief development officer for the city of Worcester. The parcels were crowded with old, abandoned buildings. Yet the properties had a long history of industrial use and were close to freight rail lines and highways, including Interstate 290. Absolute Machinery Corp., a privately held company that sells new and used machinery to the plastics manufacturing industry, had already moved in to 92-94 Gardner St. in 2006. The company’s partners liked the access to rail lines, and neighbors were supportive, said Nathan Smith, co-owner. Still, the neighborhood needed work. “We had our crew, on a regular basis, pick up the trash, weed-whack and mow a quarter-mile stretch up Gardner Street,” Mr. Smith said. The city took years lining up federal and state grants plus other funds to tear down old buildings, deal with contamination and re-work the roads. The total bill was close to $7 million. By 2013, the city created an economic opportunity plan for the area, clearing the way for property-tax breaks for new construction. Finding buyers for the city-owned land, however, initially proved difficult. Mr. Morano said. That included Jim Chacharone, president of Chacharone Properties LLC of Worcester, a company that specializes in developing commercial and industrial properties. Chacharone Properties bought three parcels and is negotiating to buy another in the park. The company built the Table Talk Pies facility and is leasing it to Table Talk, with an option for Table Talk to buy it. Mr. Chacharone said he’s planning to build two more facilities in the park. Chacharone Properties does not have tenants lined up for the properties yet. Especially now, modern industrial space is at a premium in Central Massachusetts, said James G. Umphrey, president of Kelleher & Sadowsky Associates Inc. of Worcester, a commercial real estate business. Conversion of industrial space to other uses near Boston has driven users to look for existing buildings or construction-ready space elsewhere. In addition, the growth of online shopping is fueling demand for warehouses and distribution centers close to population centers. “The majority of the industrial market has moved away from just general manufacturing to distribution and fulfillment,” Mr. Umphrey said. Top-of-the-line industrial space typically features ceilings about 32 feet high, few interior columns, powerful sprinkler systems and plentiful, well-placed loading docks for trucks. Steven Rothschild, who has launched a number of businesses, including commercial lighting business Access Fixtures LLC, said he learned what tenants need while trying to market space he owns in an older building. Mr. Rothschild is building a 22,000-square-foot manufacturing building in the park that will be called the Armory Business Center. He expects the one-story building to feature ceilings up to 30 feet high and eight or nine units for small manufacturers. It should open by the end of 2018. Mr. Rothschild estimates his investment at $4 million. Those who have bought or taken space in the park say a critical element in the city’s oversight of the neighborhood was property tax relief. Worcester taxes commercial and industrial property at $34.03 for every $1,000 of valuation. That’s more than double the rate of some Central Massachusetts communities that tax all real estate at a single rate. At Table Talk Pies on Southgate Street, Mr. Kokkinis said the tax relief was critical to staying in Worcester. “It leveled the playing field to the outside surrounding towns,” he said. Now, after investing about $4 million in Table Talk’s new site, he’s planning to install a second production line. The plant employs about 40 workers. Nearby, Absolute Machinery has spread out, adding additional space for its related businesses. Absolute Haitian Corp. sells injection molding machinery in North America. Absolute Robot Inc. distributes robotic equipment used in manufacturing. Absolute businesses employ about 25 people in Worcester. Mr. Kokkinis said he hopes that as more buildings open in the park, they will focus on industrial uses. “I do think (the park) is an example of showing what can work to do economic development in the city,” he said.